Page last edited 2013-09-01 21:57:40 (version 10). The covered market covers the area between Cornmarket and Turl Street, and Market Street and High Street. 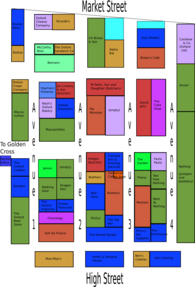 The current layout of the market dates from the 18th Century although a market has existed in Oxford since at least the 12th Century. The covered market was created due to a desire to move stalls off the busy streets and into one central area. It may seem unbelievable that this area once contained over a hundred stalls but originally the shops were much smaller with tiny fronts. Only a few shops remain in the market at the original size. There are now around 60 shops in the market. There is a mix of food shops (butchers, grocers, delicatessens, etc), places to eat (cafes, sandwich shops, etc), and shops (clothing, shoes, florists, gifts, etc). It is possible to enter the Covered Market from one of a number of entrances on the High Street, through Golden Cross, and from a couple of entrances on Market Street. Last edited 2013-09-01 21:57:40 (version 10; diff). List all versions.